Example of cybernetic thinking. On the one hand a company is approached as a system in an environment. On the other hand cybernetic factory can be modeled as a control system. Cybernetics is the interdisciplinary study of the structure of complex systems, especially communication processes, control mechanisms, and feedback principles. This field is closely related to control theory and systems theory. At the same time, both in its origins and development in the second-half of the twentieth century, cybernetics is equally applicable to social (that is, language-based) systems. Cybernetics is always and only involved when the system under scrutiny is in a closed loop, where action by the system in an environment causes some change in the environment, and that change is manifest to the system via information or feedback that causes changes in the way the system then behaves, with all this in service of a goal or goals. This "circular causal" relationship is the necessary and sufficient condition for a cybernetic perspective. The term cybernetics stems from the Greek Κυβερνήτης (kybernētēs, steersman, governor, pilot, or rudder—the same root as government). Cybernetics is a broad field of study, but its essential goal is to understand and define the functions and processes of systems that have goals, and that participate in circular, causal chains that move from action to sensing to comparison with desired goal, and again to action. Studies in cybernetics provide a means for examining the design and function of any system, including social systems such as business management and organizational learning, including for the purpose of making them more efficient and effective. A more philosophical definition, suggested in 1956 by Louis Couffignal, one of the pioneers of cybernetics, characterizes cybernetics as "the art of ensuring the efficacy of action." The most recent definition has been proposed by Louis Kauffman, President of the American Society for Cybernetics, "Cybernetics is the study of systems and processes that interact with themselves and produce themselves from themselves." Concepts studied by cyberneticists (or, as some prefer, cyberneticians) include, but are not limited to: Learning, cognition, adaption, social control, emergence, communication, efficiency, efficacy, and interconnectivity. These concepts are studied by other subjects such as engineering and biology, but in cybernetics these are removed from the context of the individual organism or device. Other fields of study that have influenced or been influenced by cybernetics include game theory; system theory (a mathematical counterpart to cybernetics); psychology, especially neuropsychology, behavioral psychology, cognitive psychology; philosophy; anthropology and even architecture. The word cybernetics was first used in the context of "the study of self-governance" by Plato in The Laws to signify the governance of people. The words govern and governor are related to the same Greek root through the Latin cognates gubernare and gubernator. The word "cybernétique" was also used in 1834, by the physicist André-Marie Ampère (1775–1836) to denote the sciences of government in his classification system of human knowledge. The first artificial automatic regulatory system, a water clock, was invented by the mechanician Ktesibios. In his water clocks, water flowed from a source such as a holding tank into a reservoir, then from the reservoir to the mechanisms of the clock. Ktesibios's device used a cone-shaped float to monitor the level of the water in its reservoir and adjust the rate of flow of the water accordingly to maintain a constant level of water in the reservoir, so that it neither overflowed nor was allowed to run dry. This was the first artificial truly automatic self-regulatory device that required no outside intervention between the feedback and the controls of the mechanism. Although they did not refer to this concept by the name of Cybernetics (they considered it a field of engineering), Ktesibios and others such as Heron and Su Song are considered to be some of the first to study cybernetic principles. 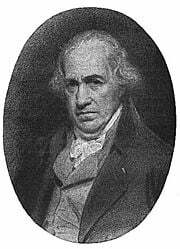 The study of teleological mechanisms (from the Greek τέλος or telos for end, goal, or purpose) in machines with corrective feedback dates from as far back as the late 1700s when James Watt's steam engine was equipped with a governor, a centripetal feedback valve for controlling the speed of the engine. Alfred Russel Wallace identified this as the principle of evolution in his famous 1858 paper. In 1868, James Clerk Maxwell published a theoretical article on governors, one of the first to discuss and refine the principles of self-regulating devices. Jakob von Uexküll applied the feedback mechanism via his model of functional cycle (Funktionskreis) in order to explain animal behavior and the origins of meaning in general. Contemporary cybernetics began as an interdisciplinary study connecting the fields of control systems, electrical network theory, mechanical engineering, logic modeling, evolutionary biology, and neuroscience in the 1940s. Electronic control systems originated with the 1927 work of Bell Telephone Laboratories engineer Harold S. Black on using negative feedback to control amplifiers. The ideas are also related to the biological work of Ludwig von Bertalanffy in General Systems Theory. Early applications of negative feedback in electronic circuits included the control of gun mounts and radar antenna during World War Two. Jay Forrester, a graduate student at the Servomechanisms Laboratory at MIT during WWII, working with Gordon S. Brown to develop electronic control systems for the U.S. Navy, later applied these ideas to social organizations such as corporations and cities as an original organizer of the MIT School of Industrial Management at the MIT Sloan School of Management. Forrester is known as the founder of System Dynamics. W. Edwards Deming, the Total Quality Management guru for whom Japan named its top post-WWII industrial prize, was an intern at Bell Telephone Labs in 1927, and may have been influenced by network theory. Deming made "Understanding Systems" one of the four pillars of what he described as "Profound Knowledge" in his book, The New Economics. Numerous papers spearheaded the coalescing of the field. In 1935 Russian physiologist P.K. Anokhin published a book in which the concept of feedback ("back afferentation") was studied. The Romanian scientist Ştefan Odobleja published Psychologie consonantiste (Paris, 1938), describing many cybernetic principles. The study and mathematical modeling of regulatory processes became a continuing research effort and two key articles were published in 1943. These papers were "Behavior, Purpose and Teleology" by Arturo Rosenblueth, Norbert Wiener, and Julian Bigelow; and the paper "A Logical Calculus of the Ideas Immanent in Nervous Activity" by Warren McCulloch and Walter Pitts. Cybernetics as a discipline was firmly established by Wiener, McCulloch and others, such as W. Ross Ashby and W. Grey Walter. Walter was one of the first to build autonomous robots as an aid to the study of animal behavior. Together with the U.S. and UK, an important geographical locus of early cybernetics was France. In the spring of 1947, Wiener was invited to a congress on harmonic analysis, held in Nancy, France. The event was organized by the Bourbaki, a French scientific society, and mathematician Szolem Mandelbrojt (1899-1983), uncle of the world-famous mathematician Benoît Mandelbrot. During this stay in France, Wiener received the offer to write a manuscript on the unifying character of this part of applied mathematics, which is found in the study of Brownian motion and in telecommunication engineering. The following summer, back in the United States, Wiener decided to introduce the neologism cybernetics into his scientific theory. The name cybernetics was coined to denote the study of "teleological mechanisms" and was popularized through his book Cybernetics, or Control and Communication in the Animal and Machine (Hermann & Cie, Paris, 1948). In the UK this became the focus for the Ratio Club. In the early 1940s John von Neumann, although better known for his work in mathematics and computer science, did contribute a unique and unusual addition to the world of cybernetics: Von Neumann cellular automata, and their logical follow up the Von Neumann Universal Constructor. The result of these deceptively simple thought-experiments was the concept of self replication which cybernetics adopted as a core concept. The concept that the same properties of genetic reproduction applied to social memes, living cells, and even computer viruses is further proof of the somewhat surprising universality of cybernetic study. Wiener popularized the social implications of cybernetics, drawing analogies between automatic systems (such as a regulated steam engine) and human institutions in his best-selling, The Human Use of Human Beings: Cybernetics and Society (Houghton-Mifflin, 1950). While not the only instance of a research organization focused on cybernetics, the Biological Computer Lab at the University of Illinois, Urbana/Champaign, under the direction of Heinz von Foerster, was a major center of cybernetic research] for almost 20 years, beginning in 1958. For a time during the past 30 years, the field of cybernetics followed a boom-bust cycle of becoming more and more dominated by the subfields of artificial intelligence and machine-biological interfaces (that is, cyborgs) and when this research fell out of favor, the field as a whole fell from grace. In the 1970s, new cybernetics has emerged in multiple fields, first in biology. Some biologists influenced by cybernetic concepts (Maturana and Varela, 1980); Varela, 1979; Atlan, 1979) realized that the cybernetic metaphors of the program upon which molecular biology had been based rendered a conception of the autonomy of the living being impossible. Consequently, these thinkers were led to invent a new cybernetics, one more suited to the organizations which mankind discovers in nature—organizations he has not himself invented. The possibility that this new cybernetics could also account for social forms of organization, remained an object of debate among theoreticians on self-organization in the 1980s. In political science, Project Cybersyn attempted to introduce a cybernetically controlled economy during the early 1970s. In the 1980s, unlike its predecessor, the new cybernetics concerns itself with the interaction of autonomous political actors and subgroups, and the practical and reflexive consciousness of the subjects who produce and reproduce the structure of a political community. A dominant consideration is that of recursiveness, or self-reference of political action both with regards to the expression of political consciousness and with the ways in which systems build upon themselves. Geyer and van der Zouwen, in 1978, discussed a number of characteristics of the emerging "new cybernetics." One characteristic of new cybernetics is that it views information as constructed and reconstructed by an individual interacting with the environment. This provides an epistemological foundation of science, by viewing it as observer-dependent. Another characteristic of the new cybernetics is its contribution towards bridging the "micro-macro gap." That is, it links the individual with the society. Geyer and van der Zouwen also noted that a transition from classical cybernetics to the new cybernetics involves a transition from classical problems to new problems. These shifts in thinking involve, among others, a change from emphasis on the system being steered to the system doing the steering, and the factor which guides the steering decisions. And a new emphasis on communication between several systems which are trying to steer each other. ASIMO uses sensors and intelligent algorithms to avoid obstacles and navigate stairs. Cybernetics in biology is the study of cybernetic systems present in biological organisms, primarily focusing on how animals adapt to their environment, and how information in the form of genes is passed from generation to generation. (Note: this does not refer to the concept of Racial Memory but to the concept of cumulative adaptation to a particular niche, such as the case of the pepper moth having genes for both light and dark environments.) There is also a secondary focus on cyborgs. An artificial heart, example of a biomedical engineering. Turbulence in the tip vortex from an airplane wing. By examining group behavior through the lens of cybernetics, sociology seeks the reasons for such spontaneous events as smart mobs and riots, as well as how communities develop rules, such as etiquette, by consensus without formal discussion. 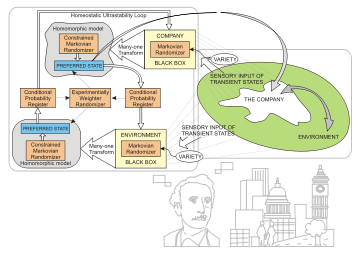 Affect Control Theory explains role behavior, emotions, and labeling theory in terms of homeostatic maintenance of sentiments associated with cultural categories. These and other cybernetic models in sociology are reviewed in a book edited by McClelland and Fararo. ↑ 1.0 1.1 Kevin Kelly, Out of Control: The New Biology of Machines, Social Systems and the Economic World (Boston, MA: Addison-Wesley, 1994, ISBN 0201483408). ↑ Louis Couffignal, Essai d’une définition générale de la cybernétique, The First International Congress on Cybernetics (Paris: Gauthier-Villars, 1958), 46-54. ↑ CYBCON discussion group 20. September 2007 18:15. ↑ Jean-Pierre Dupuy, "The autonomy of social reality: On the contribution of systems theory to the theory of society," in Elias L. Khalil and Kenneth E. Boulding (eds. ), Evolution, Order and Complexity (London, UK: Routledge, 1986, ISBN 9780203284902). ↑ Peter Harries-Jones, The Self-Organizing Polity: An Epistemological Analysis of Political Life by Laurent Dobuzinskis, Canadian Journal of Political Science 21 (2): 431-433. ↑ Kenneth D. Bailey, Sociology and the New Systems Theory: Toward a Theoretical Synthesis (Albany, NY: Albany State Univ. of New York Press, 1994, ISBN 9780791417447), 163. ↑ Kent A. McClelland and Thomas J. Fararo (eds. ), Purpose, Meaning, and Action: Control Systems Theories in Sociology (New York, NY: Palgrave Macmillan, 2006, ISBN 9781403967985). 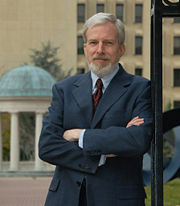 Ashby, W. Ross. 1956. Introduction to Cybernetics. London, UK: Methuen. Beer, Stafford. 1974. Designing Freedom. London, UK: John Wiley. ISBN 9780471062219. Bluma, Lars. 2005. Norbert Wiener und die Entstehung der Kybernetik im Zweiten Weltkrieg. Münster, DE. Lit-Verl. ISBN 9783825883454. Heims, Steve J. 1980. John von Neumann and Norbert Wiener: From Mathematics to the Technologies of Life and Death. Cambridge, MA: MIT Press. ISBN 9780262081054. Heims, Steve J. 1993. Constructing a Social Science for Postwar America. The Cybernetics Group, 1946-1953. Cambridge, MA: MIT Press. ISBN 9780585314754. Helvey, T.C. 1971. The Age of Information: An Interdisciplinary Survey of Cybernetics. Englewood Cliffs, NJ: Educational Technology Publications. ISBN 9780877780083. Heylighen, Francis, and Joslyn C. 2001. "Cybernetics and Second Order Cybernetics" in R.A. Meyers (ed.). 2001. Encyclopedia of Physical Science & Technology, 3rd ed., Vol. 4. New York, NY: Academic Press. ISBN 9780122274299. Ilgauds, Hans Joachim. 1980. Norbert Wiener. Leipzig, DE: Teubner. Johnston, John. 2008. The Allure of Machinic Life: Cybernetics, Artificial Life, and the New AI. Cambridge, MA: MIT Press. ISBN 9780262101264. Masani, P. Rustom. 1990. Norbert Wiener 1894-1964. Boston, MA: Birkhäuser. ISBN 9780817622466. Medina, Eden. 2006. Designing Freedom, Regulating a Nation: Socialist Cybernetics in Allende's Chile. Journal of Latin American Studies. 38: 571-606. Pangaro, Paul. 1990. Cybernetics—A Definition. Pangaro. Retrieved September 29, 2008. Pask, Gordon. 1972. Cybernetics. The Cybernetics Society. Retrieved September 29, 2008. Patten, B.C., and E.P. Odum. 1981. The Cybernetic Nature of Ecosystems. The American Naturalist. 118: 886-895. Plato, and W.R.M. Lamb (trans.). 1927. "Alcibiades 1." In Plato, Volume 12. London, UK: Loeb Classical Library. Umpleby, Stuart. 1989. The science of cybernetics and the cybernetics of science. Cybernetics and Systems. 21 (1): 109-121.
von Foerster, Heinz. 1995. Ethics and Second-Order Cybernetics. Standord.edu. Retrieved September 29, 2008. Wiener, Norbert. 1948. Cybernetics or Control and Communication in the Animal and the Machine. Cambridge, MA: The Technology Press. Norbert Wiener and Cybernetics – Living Internet. IEEE Systems, Man, & Cybernetics Society. Cybernetics and Information Theory in the United States, France and the Soviet Union. Medizinische Kybernetik | Medical Cybernetics. This page was last modified on 22 November 2017, at 17:19.